I'm a big fan of Empirical Labs and use their products every chance I get. 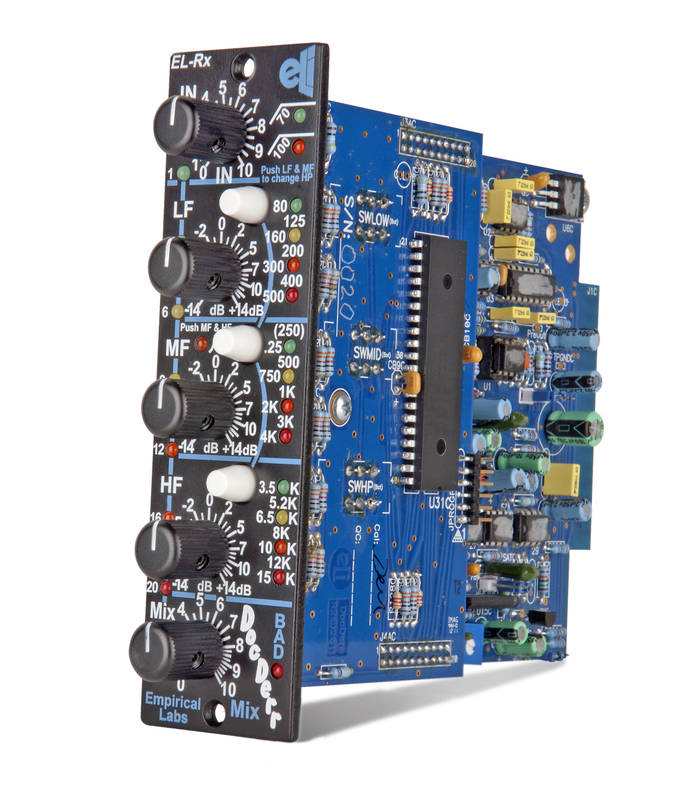 They recently announced a new 500 series channelstrip module appropriately called the DocDerr. It's available in both vertical and horizontal styles. The circuitry is identical in both only the front panels are different. I want two of these. Empirical Labs is pleased to announce the DocDerr, a brand new API 500 series multi-purpose channel strip. This breakthrough tone enhancement module houses six different sections of digitally controlled analog processing at an extremely affordable price point ($799 MSRP). 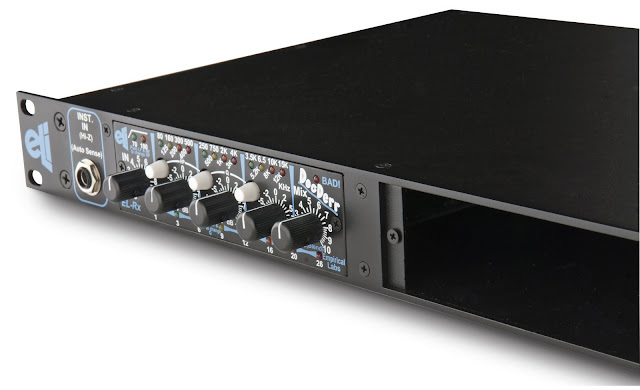 A super low-noise preamp capable of line or 16 dB of “instrument” gain is followed by four sections of EQ offering one selectable high pass and three parametric bands. The dynamics section provides renowned Empirical Labs compression at an unprecedented price, as well as a tape emulation circuit to soften high frequencies and clips. A “Mix” knob allows the user to blend the uncompressed EQ’s signal with the compressed and saturated signal. Inputs and outputs are DC coupled, and the output can be switched between single ended or differential, yielding + 6dB of gain. A “Bad!” hard clip indicator monitors most every section for internal clipping. The DocDerr model EL-Rx will be available with either horizontal or vertically oriented front panel configurations, and begins shipping July 2011. Empirical Labs Inc. (ELI) is a New Jersey-based company that designs and produces professional audio equipment and software for creative professionals. ELI products are made with one simple philosophy that drives the company and continues their success: “We want to make products that work a little easier, a little better, and a lot longer - and make sure they are fun to use." "The INPUT KNOB is the compressor’s main control (not counting the MIX control), which affects how much compression, is put on a source. The INPUT Knob follows the EQ, and drives signal into the compressor, scrunching the dynamics and peaks into an increasingly narrow range. The time constants and the curve of the compressor were selected to be as aggressive as possible without crackly unmusical distortion. The ratio is about 5:1. With an attack under 1mS, it could be considered a limiter. Above about 8 – 10dB of compression there will be saturation caused by fast time constants working on each peak of the waveform. We think it sounds very “tubey”, with nice harmonics added at high gain reduction… but, it IS a form of distortion, and it will get more prevalent with more gain reduction. Many of the classic old compressors from the 60’s and 70’s were valued for this fat distortion. One can tame any saturation by turning down the input knob, thereby turning down the compression, OR, by adjusting the MIX control to include more of the uncompressed (dry) signal in the output. When using the MIX control, the user may find they can put on tons of compression (up to 20dB), and still get a very natural sounding instrument or voice. By judiciously mixing the compressed signal under the dry signal, the sustain and note detail will come out without feeling squashed. Modern mixdown engineers use this “blend” technique all the time, but have to split the signal going to a compressor and then return it to submix the dry and compressed signal on their mixing console. For the first time, the common live instrumentalist can use this advanced compression technique just by turning a knob." Here's an article on NPR.org that gives you a breakdown on what it takes to make a "hit song". Rihanna's "Man Down" is used as a real world example and it shows the actual cost of making the record (writers, producers, engineers, studio etc.) runs in the high 5 figures but pales in comparison to the promotion and marketing costs that can easily exceed 7 figures. "Getting a song on the pop charts takes big money. That's about $53,000.00 spent on the song so far-- before Rihanna even steps into the studio with her vocal producer. Every song is different. Some songs have a momentum all their own, some songs just break out out of the blue. But the record industry depends on hits for sales. Having hits is the business plan. The majority of songs that are hits — that chart high, that sell big, that blast out of cars in the summertime-- cost a million bucks to get them heard and played and bought. But Def Jam makes up the shortfall by releasing other singles. And only then-- if the label recoups what it spent on the album — will Rihanna herself get paid. [Copyright 2011 National Public Radio]"